Line large, rimmed baking sheet with parchment paper or waxed paper. Place popcorn in large mixing bowl. In microwave-safe bowl, combine chocolate, olive oil and pumpkin pie spice; microwave on Medium for 2 to 3 minutes or until melted and smooth, stirring after each minute. 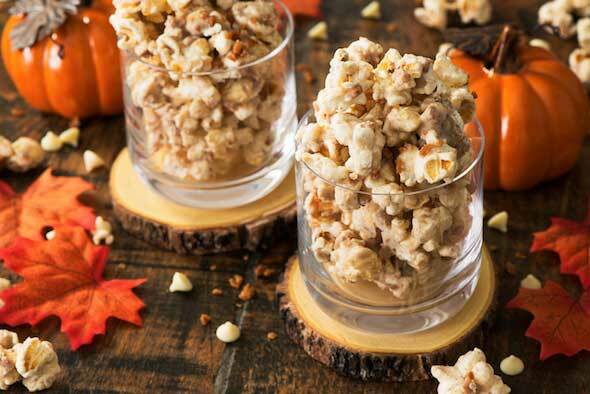 Pour melted chocolate mixture over popcorn; add toffee bits and toss to combine. Immediately transfer to prepared baking sheet, spreading to edges of pan; sprinkle sea salt over top. Let cool; refrigerate for 1 to 2 hours or until set. Break into chunks for serving.